I promise I will not write about my cat today. I can't promise I won't later this week though. We had marching band show reveal last night. I think it sounds great. Not completely happy with the title. Fire and Ice has been done to death. But its a concept based on a Robert Frost poem which makes me insanely happy. I still haven't decided if I am buying a car or not. Actually that's a lie. I checked the Kelley Blue Book and checked out trade in price for my car. I would basically be breaking even. So I think I may be buying a new car. I just cant decide what to get. Too bad I can't afford what I really want. It has rained almost everyday for a week. Downtown flooded on Friday and today water was pooling in a lot by my daughter's school. 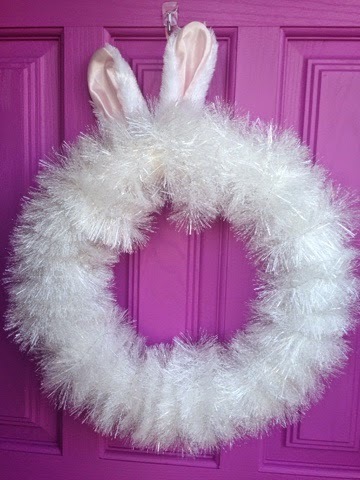 I still have my Easter wreath on my door. I totally made it myself. the wreath is so cute! and i am so over the rain. My grass is so tall, my dogs are getting lost in it. I'm kinda afraid the city will send me the mean "you need to mow, your grass is too tall" letter. Its still raining here, I wouldn't be surprised if it floods again. I've gotten alerts all evening.